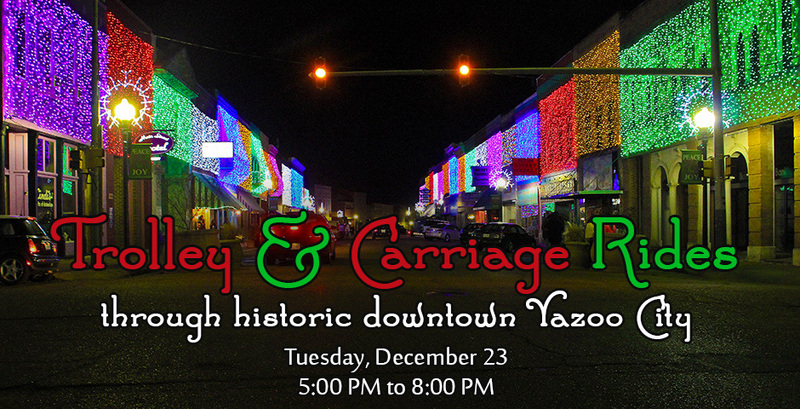 Tuesday, December 23, 2014, from 5PM to 8PM starting at the No Smoking Smokehouse – Take a Carriage or Trolley ride through downtown Yazoo to enjoy the Christmas lights. Enjoy hot chocolate or hot apple cider, or cookies & milk while you wait. All ages are welcome! The fee to ride the Trolley or the Carriage is only $2.00 (Two Dollars), so bring the whole family! AND the young ones (and those young at heart) will be thrilled to know that Mickey and Minnie Mouse will be on hand! Photos with Mickey and Minnie will be $5. Don’t miss this special evening of Christmas fun in historic downtown Yazoo City! This event is sponsored by the Yazoo County Chamber of Commerce, Paul and JoAnn Adams, Taggart Electric, and other Local Business Owners.